Just a few weeks ago, just a small sliver of western Kiowa County fell into the lowest level category along with all of Crowley and much of Otero County in southeast Colorado. Portions of Baca, Lincoln and Prowers Counties were also impacted. 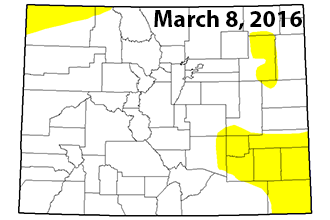 As of Thursday morning's report, all of Kiowa, along with Baca, Bent, Prowers, Kit Carson, Otero, Cowley and Pueblo Counties were all considered abnormally dry, as well as most of Las Animas, Huerfano, El Paso, and Lincoln Counties. Fremont and and Elbert Counties are also impacted, along with smaller portions of northeast and northwest Colorado. Warm temperatures and little or no precipitation marked the start of March. While this week as been cooler, the first hint of precipitation comes to the southeast Thursday night (March 17, 2016) in the form of limited snow and overnight temperatures expected to drop into the upper teens. Strong winds throughout the week have accelerated drying soils and negatively impacting crops. 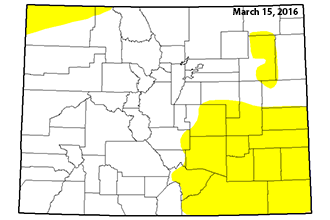 March is typically one of the wettest months in Colorado, however there is currently little precipitation in the forecast for the southeast portion of the state over the coming week.